The Lexus IS Saloon is aimed at any of you who want something a bit different in a sector dominated by the powerhouse German brands who, let’s face it, can be overly predicable. It’s strikingly designed, cheap to run and well worth a closer inspection. To convince you to take the plunge on this and not a Mercedes, an Audi or a BMW, the IS has to have something going for it other than being different, though, right? Maybe. Audi, Mercedes and BMW saloons have a lot in common, with very few features that set them apart from one another. The IS, however, is ready to offer you something bolder. As such, it’s dropped all diesel’s from its engine range in an act of heresy that already tells you this is a bold car for a bold buyer. The new car handles better than last time around, but while it’s a satisfying enough proposition on the road, it isn’t going to convince keener drivers who like to be entertained. The steering is precise, the brakes are strong, and there is plenty of power on offer. 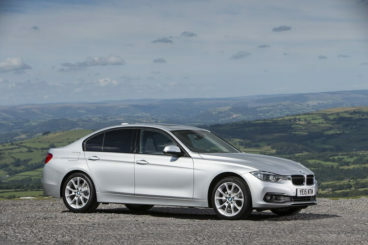 Overall, though, it lacks the agility and sharpness of, say, a BMW 3 Series. And while there is a hybrid model available, it’s wedded to a CVT automatic ‘box only. This is frustrating because the CVT is noisy and disconnects you from the driving experience. 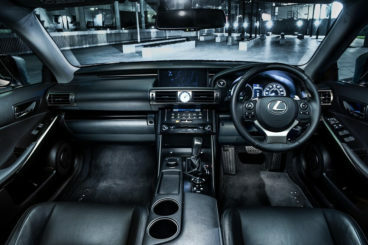 Lexus wanted to make their IS sportier, though, and to achieve this, they have added a dial which controls the amount of engine noise that enters the cabin. However, it’s mostly artificial so it doesn’t actually sound all that pleasant. It’s much better to just switch it off and enjoy the silence. As mentioned, there are no diesel engines available. Before this rubs you up the wrong way, consider the turbocharged 2.0-litre petrol engine which, by virtue of being a turbo, is efficient and economical and therefore acts as a good replacement for a diesel. It’s also powerful. Capable of delivering up to 242bhp, it covers the 0-62mph dash in just 7.0 seconds. It comes mated to an 8-speed automatic gearbox which, although not without its faults (it’s a bit unresponsive at times), compliments the engine’s performance potential. The hybrid model relies on a 2.5-litre four-pot engine that is part petrol and part electric and delivers up to 220bhp. According to official figures, the engine can get the IS 300h from rest to 62mph in 8.3 seconds, but it didn’t feel as quick as that when we tested it. It has a top speed of 124mph, but its CVT gearbox sounds like a kid in the backseat who constantly wants to know if you’re there yet. The distinctive dashboard is a really pleasing aspect of the IS Saloon’s interior, and it certainly offers a contrasting aesthetic to the rather restrained sophistication of an Audi cabin. It’s also significantly different to the exaggerated stylishness of a Mercedes saloon. The dash indeed looks almost futuristic, and while this won’t appeal to everyone it will appeal to those of you who appreciate something a little bit more out there and – dare we say it – unique. There is, however, a bit too much grey for our liking, but the satin silver trim promises to liven things up a bit and saves the cabin from leaving you to feel completely cold. A few neat touch-sensitive heating controls populate the dash, while any model that comes with the brand’s satellite navigation infotainment system also get treated to a nifty joystick controller that you’ll find in the centre console. This saloon can easily keep up with its German rivals when it comes to interior space. The hybrid model lets the team down somewhat by sacrificing 30-litres of its boot space a battery pack, but other than that the IS is no slacker. Thanks to bigger dimensions and slimmer front seats, the car can now offer more legroom than last time around. The driver and their passenger are especially well accommodated, while storage space is fantastic, thanks to nice touches such as a box carved into the front central armrest. It will come in dead handy. The boot measures 400-litres, which is competitive with this car’s rivals. However, as well as losing 30-litres of its boot space, the hybrid model doesn’t come with a 60/40 split-folding rear seat configuration. The IS spoils you with its levels of standard equipment. All cars across the range get treated to alloys, power adjustable heated door mirrors, electric windows, and a 7” display screen. The Luxury trim adds larger alloys, rain sensitive wipers and parking sensors, while the Executive Edition rewards you with 17” alloys, and heated adjustable leather seats. The Sports model, meanwhile, throws in luxuries such as 18” black alloys, a black honeycomb-like gripe and sat nav. Prices for the new car start out from around £29,000 and rise to just shy of £37,000. If you want to lease the car, you can pick up a deal from as little as £220 + VAT per month dependent on specifications. For more information on our leasing deals, you can check out our page here. 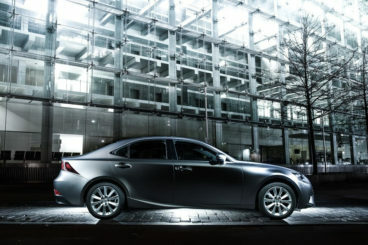 If you’re prioritising low running costs, you’ll want to take a closer look at the IS 300h hybrid model, which Lexus claim can achieve fuel economy returns of around 65.7mpg off a sensible drive. The likelihood that it will average 60mpg, which isn’t bad but not as good as its German rivals. The turbocharged 2.0-litre petrol engine is decidedly less cheap to run, and averages fuel economy returns of 39.2mpg. The insurance ratings have not yet been revealed, but we expect it to hover around the group 32 mark. One of this car’s biggest strengths is easily its reliability record. It came first in CarBuyer’s Driver Power 2015 survey and has a solid reputation for long-term dependability. Even the hybrid model, with all its complexities, won’t let you down. Many saloon buyers like to cross off ‘comfort’ when purchasing their next car, and we’re pleased to say that this can be the first thing you cross off here. The ride is comfortable, smooth and quiet. The angular styling of this car is certainly different to everything else in this market, and its cues are taken from the LF super car. The dynamic detailing is refreshing, and ensure that you won’t be driving around in just another saloon car. The hybrid model is the most efficient in the range, but it’s hard to recommend when it’s nowhere near as economical as many diesel engines in the IS’ rivals’ ranges. The turbocharged petrol engine, meanwhile, makes no sense if running costs are one of your concerns when buying a saloon – just like the total lack of diesel engines makes no sense here. And it’s really that lack of diesel engine that lets things down. Lexus wanted to be different, but did they really have to ditch the diesels? We’re not so sure. 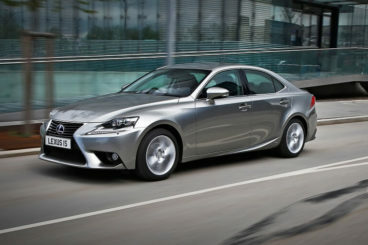 Let’s see how the car stacks up against its nearest competitors in the comparison section of our Lexus IS Saloon review. The new BMW 3 Series is generally regarded as the benchmark against which everyone else in this market is measured. All models in the range are entertaining on the road, thanks to plenty of grip, firm suspension and steering that is well judged. Get up to motorway speeds, and you’ll notice the hint of a dead spot in the steering, but apart from that this car can’t be beaten when it comes to drivability. To really enhance its road qualities, though, we suggest that you snap up the optional adaptive dampers. The entry-level 1.6-litre 318i engine can get you from rest to 62mph in 8.9 seconds, and things get quicker from there on in. The 330i, for example, covers the same distance in just 5.9 seconds, while the high performance 340i unit dusts it off in 5.5 seconds. There is also a hybrid engine and a few diesel’s to choose from, and these come with some excellent running costs. The 320d Efficient Dynamics power plant is good for returns of 74.3mpg. The interior is – as always from BMW – of a high quality. The design of the cabin is smart, the layout is logical, and top-notch materials are used throughout. Fit and finish is impeccable, and sitting inside here is a pleasure. The driver-focused dashboard feels well laid-out and features a contemporary wraparound design that is very much flavour of the month at the moment. This version of the 3 Series is the biggest so far, which means more leg and headroom. The boot, meanwhile, measures 480-litres. 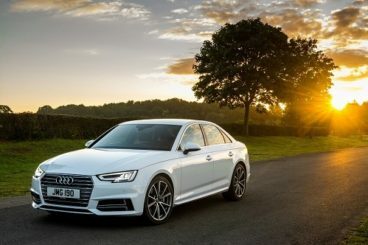 The new Audi A4 Saloon is a massive improvement on its predecessor. It has more spacious, more comfort, and is significantly cheaper to run. A common complaint about the A4 last time around was its numb steering. Essentially, the car just wasn’t all that much fun to drive. However, thanks to sharper steering and more feedback, it’s now agiler and – dare we say it – more fun. Body lean is minimal, thanks to a softer suspension setup. The engine lineup has also been improved, with a handful of new engines added. These include a 2.0-litre turbocharged TFSI petrol engine which is available in two guises, as well as a turbocharged 1.4-litre 148bhp petrol unit. Running costs have been dramatically improved, and the cheapest engine to run – a 2.0-litre Ultra diesel – is almost the most frugal engine in the entire class. Capable of returning fuel economy of 74.3mpg. Audi’s generally don’t do duff interiors, and they haven’t blotted their copy book here. Stuffed with standard equipment, advanced tech and gadgets, it all feels very contemporary. It also takes a few design ideas from the slick TT Coupe, which means you get a saloon that looks edgier than many of its rivals. The boot still measures 480-litres, but this isn’t exactly a bad thing. And although loading larger items can sometimes be a bit of a pain thanks to the boot’s shape, folding rear seats are standard across the whole range. Interior space, meanwhile, is much better than last time around, and thanks to the new design passengers get more head and leg room. If you’re fed up with what the usual suspects are offering at this end of the market, the new IS is next in line. It certainly looks different to what we’ve become accustomed to, with its angular, edgy design giving it plenty of dynamism. The car has plenty of substance, too, and if – like a lot of saloon buyers – you look for comfort, refinement, space, class and economy, the new Lexus IS Saloon could be the way forward.